Perfect for on-the-water or backwoods adventurers looking for a soft, portable cooler with exceptional ice retention and ultimate durability. 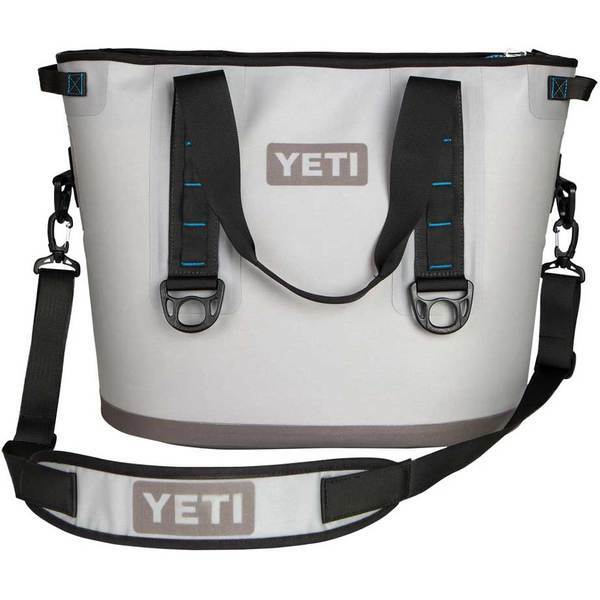 Built for the wild, YETI Hopper coolers incorporate materials and construction that make them one of the most durable “soft” coolers that money can buy. The DryHide™ interior and exterior shells, which are made of the same material used in whitewater rafts, provides tough-as-nails durability. The exterior boasts a double TPU coating, making it waterproof, impenetrable and fade resistant. The seams are RF welded which eliminates stitching and assures watertight integrity. The design is further enhanced by the HydroLok™ zipper and U-Dock locking system, much like those used in survival suits, which assures a waterproof, air-tight closure, even if the cooler is turned upside down. Six D-ring tie down points make securement easy. HitchPoint™ Grid of straps allows you to connect and customize your cooler with accessories like bottle openers, carabineers or key chains. The high-density foam bottom adds stability and further enhances abrasion resistance. Ice keeping ability is excellent, with ColdCell™ foam insulation that keeps ice for days. Three double-stitched carry options easily bear the heaviest of loads.